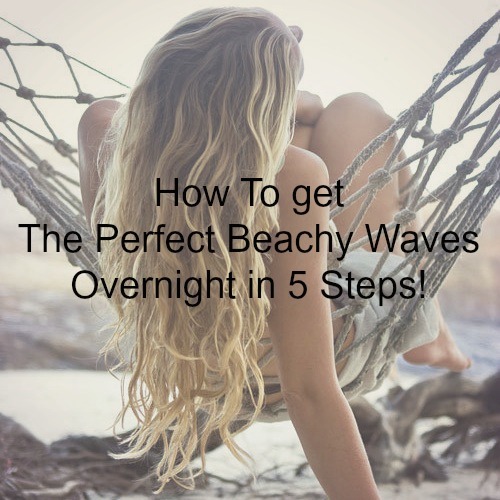 Beauty Blog by Angela Woodward: How can I get Beach Waves? So first things first, beachy waves means a million things to different people. If you do a google image search on "Beach Waves" you will get people with loose ringlets, curling wand looks, messy looks, tighter curls, Victoria Secret curls, and what is crazy is different readers probably picture something different then I do as they read each of these descriptions. To me a beachy wave is like the one I have pictured on the left. Messy, inconsistent, fun and casual. This is the look I will be telling you how to do in just 5 steps. Step 1 - Gather Supplies! For this look you will need 1 flat iron (or 1 large barrel curling iron), a set of overnight rollers, a spray bottle with water in it, heat protectant and a texture spray. I recommend Redken Iron Shape 11 (pictured on the right) for your heat protectant, because it give a little hold and really works when it comes to keeping your hair safe. Step 2 - Before Bed Prep! Step 3 - Post Sleep Prep! After you have woken up in the morning you need to remove the curlers. The results will not be pretty. The hair will probably look a little frizzy and jacked. That is okay. Use your fingers to lightly comb through it (not to much because you don't want to make it frizzier), and then spray your Heat Protestant on the hair. Take random sections and curl them using your implement. Try and do loose curls, and make sure they do not all go back or forward. I usually recommend doing a few in the front, and then the ugliest pieces from the rollers. Why are we not just curling them all this way? Using the rollers gives an inconsistent look and texture to the hair that is key for a messy and casual look. Now you should use your fingers to lightly comb through the hair again. This blends everything. Once it is the way you like it (don't let it get to pretty though), use a texture finishing spray. My favorite is Redken Wind Blown 05 (pictured on the left). This is because it actually moves your hair while giving it hold to give it a wind blown look that is perfect for this! I can't wait to see your best beachy looks!